Yet there were always reasons not to go: starting my study, having little money as a student, saving for my wedding, starting my first job, starting my second job… But on an early morning in January 2014 I finally set myself to the nerve-racking task of asking my manager for a sabbatical. Because I choose not to care about all those reasons anymore. I just wanted to travel! Luckily, my manager fully supported my dream to travel and I was granted a five month sabbatical! For several reasons I wouldn’t leave for another year which left me plenty of time to do research for the trip. Which I did. A lot. Particularly for the Philippines, because the country consists of so many islands! 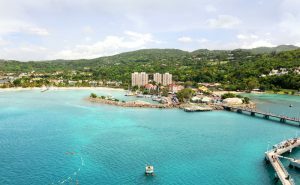 It would probably take a lifetime time to visit them all, so I set myself to the impossible task of choosing which islands to visit. This was truly difficult, because every Google image I found was more beautiful than the last one. For weeks I researched gorgeous islands and my favorite source of information were blogs of people living in the Philippines for a year or longer. Because if someone like that placed an island in their top 3, while having visited more than 20, that island definitely secured itself a place on my shortlist. This led to my personal Tropical Island Top 3 and consequently my trip itinerary. 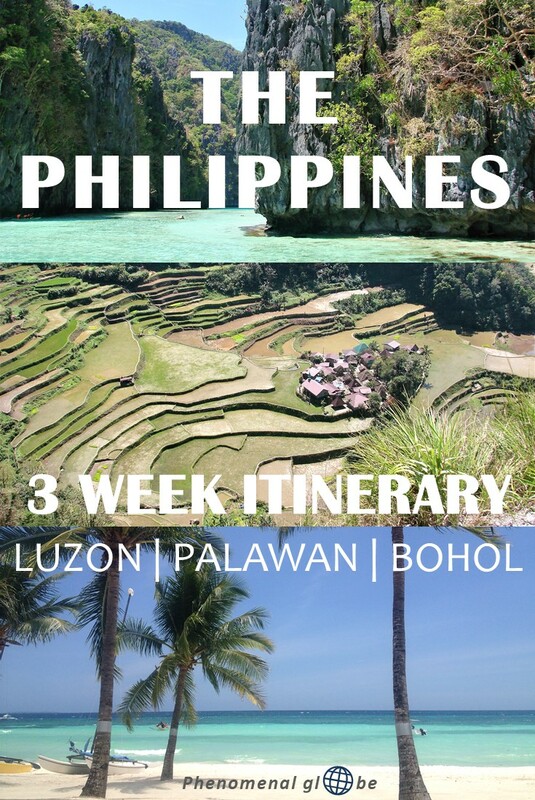 In the map below you can find my Philippines itinerary, the accommodations I stayed at and all highlights of my 3 week around Luzon, Palawan and Bohol. 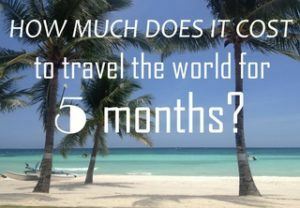 If you want to know more about the costs of this trip, be sure to check out my Philippines budget breakdown post. What language is spoken in the Philippines? The official languages of the Philippines are Tagalog and English (the Philippines were under American rule for quite a while). That being said, because the Philippines consists of so many different islands there are over 180 different languages and dialects! Which currency is used in the Philippines? The currency of the Philippines is the Philippine peso. When we traveled the Philippines the exchange rate was approximately 50php for €1 and 45php for $1. On this website you can find the current exchange rates. While you can travel to the Philippines year-round, the best time to go is during the dry season which runs from December until April. We visited during February, which was perfect as it wasn’t too hot yet (March and April usually are). I personally did not feel completely save in Manila, therefore my husband and I took a cab straight from the airport to the Ohayami bus terminal. We left our bags at the bus terminal and walked around for some food and drinks until it was time for the night bus to leave. The drive to Banaue took about nine hours and we stopped three times along the way, sometimes near a public toilet, sometimes not… We arrived early in the morning at Banaue bus station, where everybody got off the bus and was shuffled into jeepneys. Our jeepney took us to Uyami’s Green View Restaurant where we had breakfast and arranged our tour. There were many people selling tours walking around the restaurant so for us it not arranging this beforehand worked out fine. We teamed up with 4 French travelers to arrange a good group deal and after packing everything we needed into our day pack we were off for a three day hike through the famous rice terraces of Banaue, Cambulo and Batad! 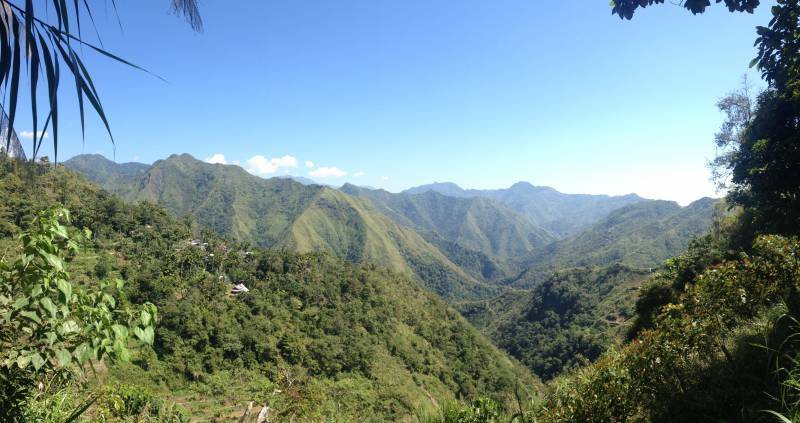 Day 2 – 4 Hiking in Banaue! Hiking through the rice terraces was amazing, I had never seem something like it before in my life and we were very lucky with the weather and our fun group. Accommodation was included in the tour price, read more below. I have thoroughly searched the web but could not find the accommodation in Cambulo were we stayed during the first night of our hike. Which is not surprising since it’s a teeny tiny village. 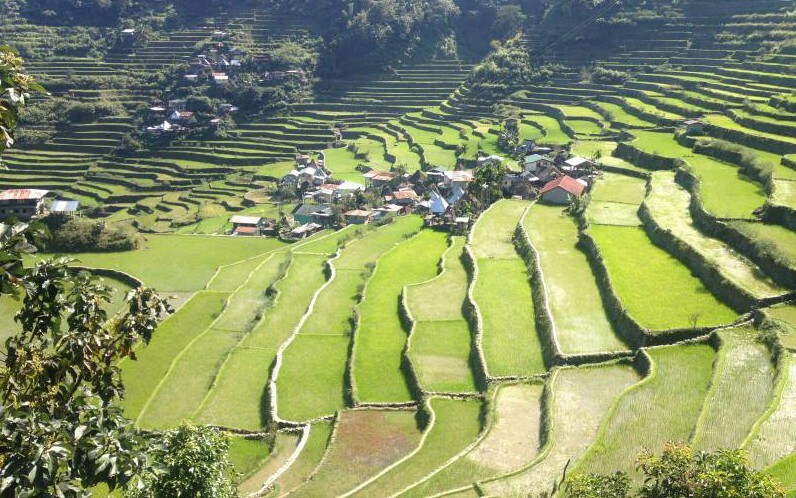 Just to give you an idea what to expect when you are going to hike in Banaue: accommodation is very basic. During our first night there was no shower and only one small toilet with a bucket. Nevertheless, the bed was clean and I slept like a baby because I was completely exhausted. In Batad we stayed at the Hillside Inn. This hostel did have a shower (with warm water!) which was shared with two other rooms, a clean but not very soft bed and a beautiful view from the balcony overlooking the rice terraces. Breakfast was not included, but with 70php for a delicious chocolate banana pancake you don’t hear me complaining. Click here for the latest prices. The bus from Banaue to Manila left at 7pm and was pretty much the same as the way there. We arrived at the Ohayami bus terminal in the middle of the night (around 4am) and shared a cab to the airport. There we made a big mistake. Reason #1: we shared a cab to the airport with two of the French girls we met during the hike. Their flight would leave from terminal 4 while our flight would depart from terminal 3. Because their flight would leave first we decided to let the cab driver go to terminal 4. What we should have done: Ask the cab driver to take us to terminal 3 after dropping our friends off. Reason #2: we were completely and utterly out of cash. Because there is no ATM in Banaue and we had spent every peso. Reason #3: not one of our bank cards worked at the ATMs at terminal 4. Which meant we were stuck. Obviously if you have cash, you can just take another cab to terminal 3. Or make use of the paid shuttle bus between all the terminals. Since the airport employee we spoke to at 5am in the morning failed to mention that this was a paid service, we actually waited for this shuttle for more than three hours. When it finally arrived we were thrown out because we couldn’t pay, which was totally embarrassing since the fare was about 50php each…. Ultimately I begged an airport employee to let us into a part of the terminal from where you could take the FREE airport shuttle service which is only available for people who land at terminal 4 and have a connecting flight at another terminal. Seeing the tears in my eyes (and probably having seen us waiting there the entire morning) he compassionately let us in and half an hour later we finally arrived at terminal 3. Where I got loads of cash from the Citibank ATM (the only bank that doesn’t charge a fee) and stuffed myself with comfort food to get over this ‘traumatic’ experience. I learned some valuable travel lessons that day! Lesson #1: ALWAYS, ALWAYS, ALWAYS have cash. And put some backup cash in an inconspicuous place in your bag. To avoid situations like the one I ended up in. Lesson #2: Do not get out of a cab until you are exactly where you want to be. Just be persistent, repeat your destination or show it on the map of your phone and don’t get out. The rest of our travel that day went off without a hitch, and a short flight and even shorter tricycle ride later we arrived at Tia Mers Guesthouse in Puerto Princesa. 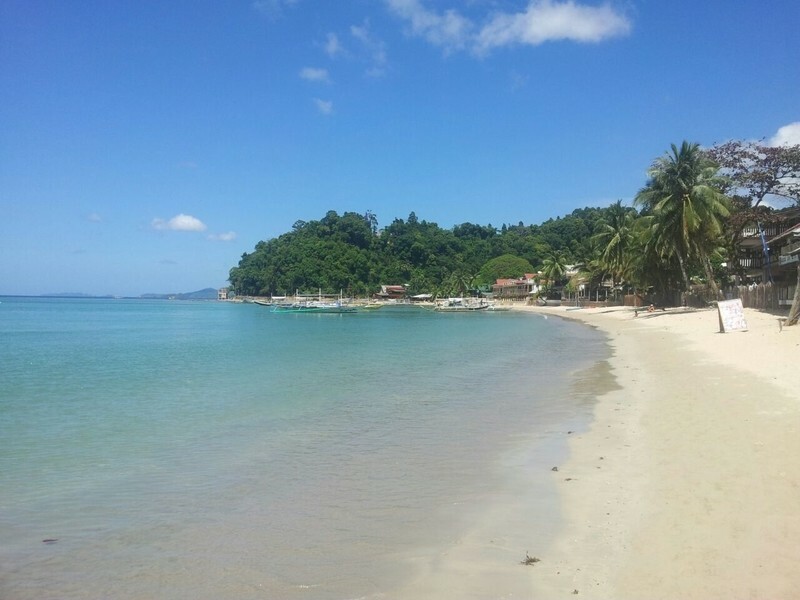 I booked Tia Mers Guesthouse via Agoda just a few hours before we arrived on Palawan. The very friendly hostel owner did not see my booking until late, which is why we did not get the complimentary pick-up from the airport. After apologizing extensively for ‘failing’ to pick us up (not a problem at all, there are plenty of tricycles which will take you to the hotel for 100php and probably even less if you are better at bargaining than I am), the owner gave us an upgrade to a huge, comfy and clean room with air conditioning. We paid €11,50 (575php) for one night and breakfast was included. Click here for the latest prices. Oh Roro bus, we could have been such good friends… I had done research and to say my expectations were high would be an understatement. The bus would be air-conditioned! The bus would be modern! The bus would leave on time! The bus would take five hours! The bus wouldn’t stop to pick up people along the way! It stopped everywhere. And I mean everywhere. Be it a bunch of school children that rode along for a couple of kilometers, a shop owner that needed a 50kg bag of rice delivered in the next town, an old lady going who knows where. Hence the eight hours. No, Roro bus was not what I expected it to be:-). And yet, as I’m sitting here, writing this post, I am smiling from ear to ear. Because who cares that it was not what I expected. And that I was six hours late. Late for what? I didn’t have to be anywhere. So I relaxed and enjoyed the ride. And ended up getting stuffed with snacks by the old lady next to me. Who didn’t speak English. But who tried to make a conversation anyway. At that moment I truly understand that to travel is to go with the flow. And to enjoy these little moments instead of getting upset or annoyed. These moments will be among your fondest memories once you’re back. In your ‘normal’ life. Where people get really upset if you are three hours late, heck, they get annoyed if you’re five minutes late. So explore. Enjoy. Experience. And let go. In El Nido getting around is extremely easy, there are tricycles everywhere and the center is very small so you can walk almost anywhere. We did tour A and C, a PADI Open Water Course and most of all: we relaxed and enjoyed the stunning surroundings! Our stay in El Nido was great, but unfortunately I cannot find the guesthouse we stayed at online. Below you can find a map with my attempt to draw the location of the guesthouse. The thing is, the guesthouse had not officially opened yet, it didn’t have a name or sign indicating that it was a guesthouse at all. We just happened to bump into it, after a disappointing round trough El Nido (everything was fully booked because of the Chinese New Year which we did not expect and had not accounted for;-). A little desperate we asked the friendly old lady sitting in her garden if this was a guesthouse and even though she said ‘Not open yet’, she showed us a small room with private bathroom and air conditioning and said we could stay there if we wanted. And so we did. For €16 (800php a night), not including breakfast and with terrible Wi-Fi. Nevertheless, we were very happy we had found something and because it felt more like a home stay than a hotel. Along the way more people were picked up, at one moment there were 15 people in the van while it was actually fit for about 10. It came to the point where the driver was sharing his seat with another passenger! Nevertheless, just six hours later we arrived safely at Palawan Village Hotel. Unfortunately Tia Mers was fully booked on the day we came back to Puerto Princesa after a weeklong stay in El Nido so I booked a room at Palawan Village Hotel instead. We had a good stay, the staff was friendly and let us store our bags behind the reception desk after check-out so we did not have to carry everything around while exploring Puerto Princesa. The included breakfast was ok but nothing special, the free Wi-Fi was very slow and only available in the lobby. But the room was clean and the bed was good. Close to the airport, but you need a tricycle to get to the city center of PP. We paid €14 (700php) for one night including breakfast. Click here for the latest prices. After a morning of sightseeing in Puerto Princesa we took a tricycle to the airport for our flight to our next destination: Cebu. At tiny Puerto Princesa Airport we discovered the existence of a terminal fee, which doesn’t actually buy you anything, just entry into the terminal. A clever invention to make you pay more money (150php per person). Another fun flight with Cebu Pacific brings us to Mactan-Cebu International Airport. As soon as we step out of the terminal the usual taxi touts try to sell us an expensive ride to the city center. But we decisively cross the street, take a right and walk up to the official taxi stand where an airport employee directs us to a taxi and hands us a piece of paper with the taxi number of the taxi we’re getting into and phone number of airport taxi service. If something happens, at least they will know which cab you were in and you know which number to call to report the problem. It’s rush hour and the ride to our hotel takes over an hour. The great thing about traveling is that you are (almost) never in a hurry, so we just sit back and relax. Our taxi driver is a friendly guy who tells us more about the city and gets us to the hotel safely. I did not actually mean to go to Cebu city, but we ended up there one night because flying from Palawan to Cebu and crossing by boat to Bohol on the same day proved a bit too ambitious. We stayed at Skypark Pensionne. The shower was good and the bed as well. Nothing special, but definitely fine for a night. We paid €16,50 (825php) for a night, no breakfast included (but a small and ridiculously cheap bakery next door). Click here for the latest prices. Thinking back about this day, it still amazes me how everything worked out so perfect. We hadn’t booked anything; the only plan was to get to Bohol that day. After a short walk to Cebu pier we found a seat on a boat from Weesam Express where we ended up sitting next to a friendly Philippine gentleman. We started talking about all sorts of things and found out he lived on Bohol. When we mentioning that we were planning to go to Loboc he broke into a wide smile and proudly declared that he lived there. And immediately offered us a ride! So instead of trying to get from Tubigon to Loboc by bus or tricycle or taxi or a combination of these; we got out of the boat, followed the friendly gentlemen to a white jeep with a driver, got in and arrived in Loboc within an hour after stepping of the boat! 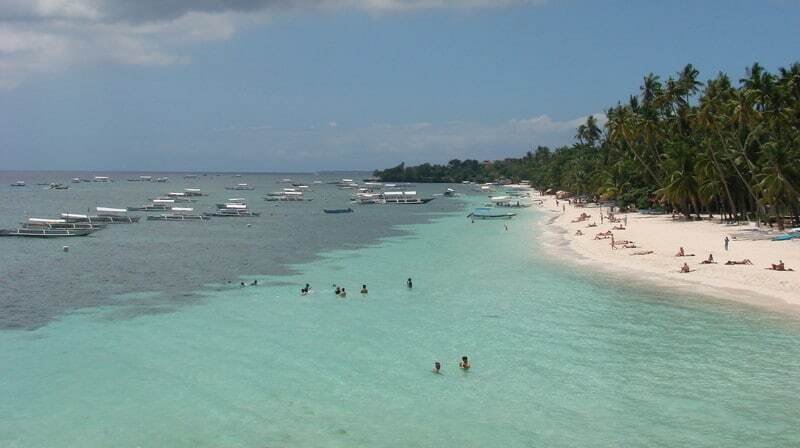 Two of my favorite accommodations of our trip in the Philippines were on Bohol. 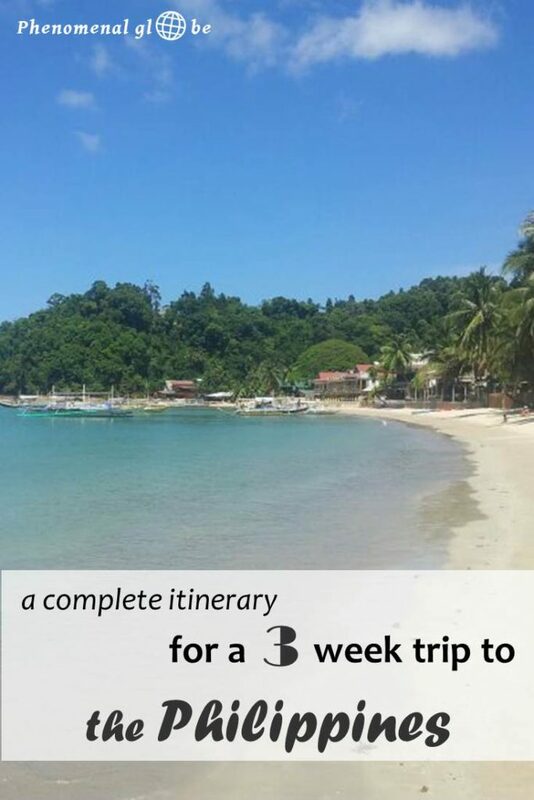 I had not booked anything so the day we arrived in Loboc I had no clue where to go. I remembered reading something about Nipa huts so we asked for directions and started walking there. It was far! And it was… depressing. The pictures on Agoda must have been taken more than 10 years ago because it looked nothing like it. Fortunately, we had passed another accommodation on the way to Nipa huts, so we decided to try our luck there. I am so glad we did! The Fox & Firefly Cottages was one of the nicest and prettiest places we stayed during our five month trip. We enjoyed speaking Dutch with the owner as well as relaxing in the hammocks on the veranda. The little cottage was so cute and the food and homemade bread was delicious (breakfast is not included). There was a serene outdoor shower (don’t worry, you can lock the door;-), very clean and a cool experience! I totally recommend staying here, we were sorry to leave after one night already. We paid €28 (1400php) for the cottage, so it was a bit pricier than our other accommodations, but you have to ‘splurge’ every once in a while;-). Click here for the latest prices. Our streak of transportation luck continued our entire week on Bohol. The next day, after a fun sightseeing tour on a scooter, we walked from our cute cottage (Fox & Firefly Cottages) to the main road and within 5 minutes a bus passed. We learned from our bus trip from Puerto Princesa to El Nido that there are no such things as bus stops in the Philippines so we put up our hand and sure enough: the bus stopped! We got in, bought a ticket to Tagbilaran and arrived 30 minutes later. At Tagbilaran bus terminal we ask a jeepney driver how to get to our hotel on Panglao and after showing him the address he quickly points us to the right jeepney. 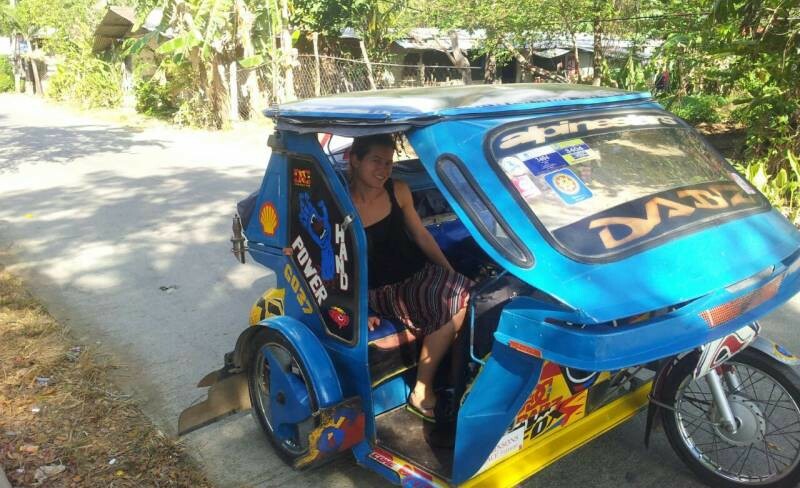 Do not ask the tricycle drivers, they will tell you it’s not possible to get to Panglao by jeepney. Or that you’ll have to wait very long for a jeepney to depart. Or that the jeepney ride will take a very long time. Whatever they think gets you in their tricycle. Anyway, after a ride via who knows where (you cannot really see anything from inside a jeepney, particularly not if it’s completely filled with people and the only thing you see is friendly smiling faces from locals who are wondering what the heck these crazy tourists are doing in a local jeepney) the jeepney stopped and the driver declared that we had arrived. Looking around and not seeing anything remotely looking like a hotel, we worried for a brief moment that the driver might not have entirely understood us correctly. We decided to walk towards the ocean anyway, because on the hotel pictures we had seen rooms with an ocean view. And sure enough, after just 10 minutes of walking we arrived at Royal Paradise Guesthouse. Thank you mister jeepney driver! At Panglao we stayed at Royal Paradise Guesthouse, the other accommodation on Bohol I really liked. I actually booked it through Airbnb, later I found out you can also book through Agoda. Just check both to see where you can get the best price! Staying at Royal Paradise was great! The view from our room was fantastic, we could see the ocean from our comfy bed! Everything was clean and the private shower was hot. The best thing about our stay however, was the staff, they were so friendly and accommodating! They drove us to Alona beach and picked us up again for 100php a day. Breakfast was really nice and included in the price. Definitely recommend, but please note that if you want to be able to walk to Alona beach this is not the place for you (it’s a 8km drive). We paid €25 per night (1250php). Click here for the latest prices. For two relaxing days our routine was: get out of bed, look at the gorgeous view from our room, have delicious breakfast, get on the back of a scooter (me squished between the friendly hotel employee and my husband) and drive to Alona beach. There we would relax all day before being picked up by the scooter again to go back to our hotel. Alona beach was very pretty, though not as pretty as El Nido with its impressive lime stone formations. 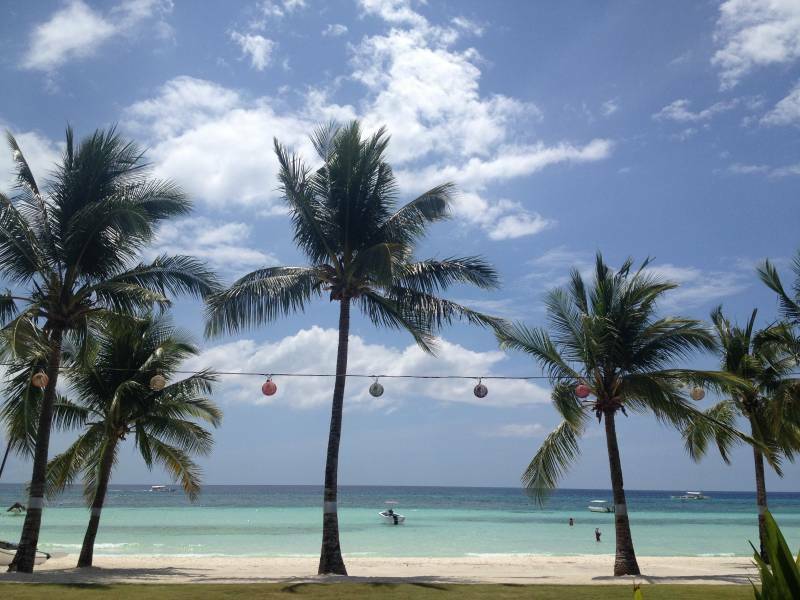 But the ocean was a beautifully blue, the atmosphere was very laid-back and we ate the best food of our Philippine trip at Oasis Beach resort. A little sad to leave another perfect paradise behind, we left for Tagbilaran. Walking to the corner where we were dropped off on the outward journey we started wondering whether this was actually part of the normal jeepney route or that the friendly driver had made an exception for us. But before we could worry too much about it our lucky Bohol transportation charm kicked in again and a jeep stopped in front of us asking if we needed a ride. Sure, that would be great! Dropped off in the center of Tagbilaran within 15 minutes we couldn’t believe our luck! Again! A short tricycle ride later we arrived at our hotel. Looking for more travel inspiration? 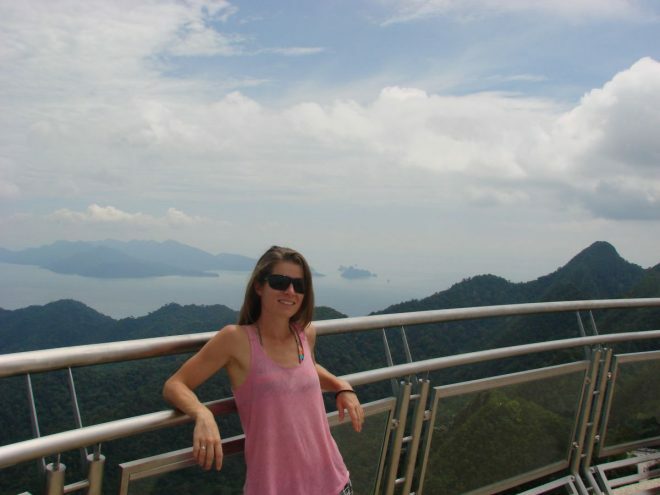 Check out my Southeast Asia island guide! Our final night in the Philippines we stayed at Casa Rey Francis Pension House which was not one of my favorites to say the least. The room smelled terrible, very moldy and damp. The toilet did not have a seat and the air conditioning was very noisy. All in all definitely not the best stay we had on Bohol. We paid €15 (750php) for a night, the average Agoda rating is 6,1. My advice: find another place to stay! Our last day in the Philippines… We sure made it count, transportation wise… early in the morning we left our hotel and took a tricycle to Tagbilaran Pier. Here we encountered another example of Philippine bureaucracy/touristocracy. The day before, we had already bought our tickets so we headed straight for the ferry terminal. We had to get a seat number first. Which they assigned at the ticket office located at the beginning of the pier. Ok, no problem. So we headed to the SuperCat office, got our seat number written on our ticket and walked back to the terminal. There we had to hand over our large backpacks and pay 100php per bag; they would be put in the luggage room of the boat. Ok, no big deal, just go with it. We then entered the terminal, where, how could we not have seen this coming, a terminal fee was levied. I have to admit, the Supercat catamaran was way more modern and comfortable than the Weesam boat (that looked more like a submarine, unfortunately, I don’t have a picture) we had taken to Tubigon on our way to Bohol. After just two comfortable hours we arrived at Cebu Pier. Our big backpacks were right next to the exit, which apparently counted as the luggage room worth 100php a bag. On the plus side, this made getting of the boat quick and easy; we were on our way to the airport in a taxi within minutes. A word of advice: don’t take the first cab you are offered by the ever present taxi touts. We walked for about 100 meters and found a friendly, non obtrusive taxi driver who drove us to the airport within half an hour (no rush hour this time). After some waiting we boarded our plane to Manila, from there we left the beautiful Philippines and flew to Hanoi. But not before paying another terminal fee of 1100php a person. Ah well, the Philippines were phenomenal and totally worth the ‘hassle’. 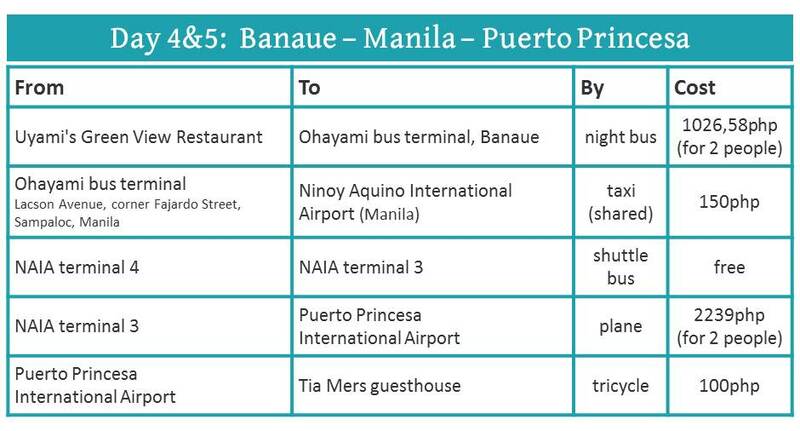 Are you traveling to the Philippines and want to have all this travel information in 2 convenient pdfs? You can download the itinerary and the hotel information below. 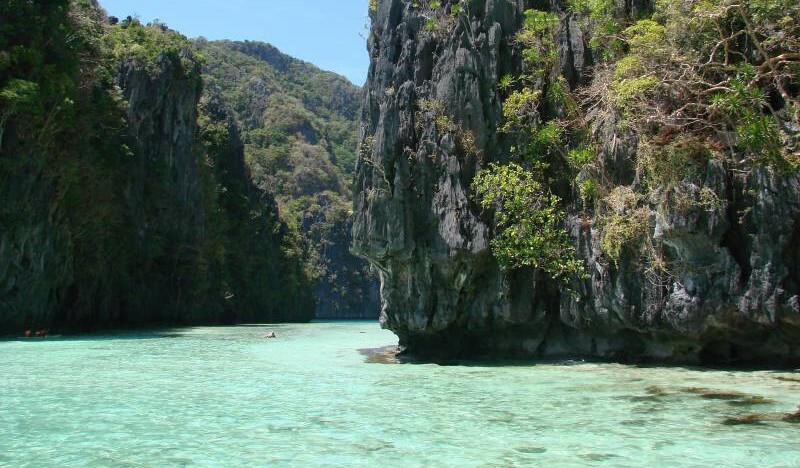 Great post, the hiking in The Philippines is just fantastic. It’s great you put down so much detail about your trip. It will definitely help anyone planning their adventure. Hey Jess, thank you so much for your kind comment! I am glad you liked the post and found it helpful:-) I loved the Philippines and hope to make another trip to more amazing places there in the future! Hello! This is so helpful. I was wondering what airline you went through and if you booked flights in advance? Im traveling to the Philippines in a few months and am trying to figure out how to fly around? Thanks! Hi Chelsea, I am really happy to read you find my post helpful:-) Awesome you’re visiting the Philippines in a couple of months! Regarding my flights, from Hong Kong to Manila I flew with Philippine Airlines, all the other flights were with Cebu Pacific (check their mascot Ceb, it’s hilarious;-). I booked all my flights in advance, Cebu Pacific has regular Peso sales and other promotions so I definitely recommend keeping an eye on their website to score a good deal! Let me know if you have any other question, happy to help! Have a great trip, I am sure you’ll love the Philippines! Very welcome, always happy to help! Im glad it worked out for you but I think you spent WAY to much money IMO. I go to Philippines 2-4x a year if possible. I travel alone all the time and have never felt unsafe, even late at night but then there is the saying, if you look for trouble you will find trouble. Good idea to always have money but you could have just asked a taxi driver to take you to another ATM. They dont ask for payment until after the ride. The free shuttle ride should not have been a problem or big deal. I use it all the time and have found most everyone to be very accommodation especially if you dont act like an entitled uppity tourist. The biggest issue I have seen is most tourist think they are better than the locals. I have gone home with taxi drivers to have dinner when I was invited. I have stayed in houses smaller than my bathroom back home and never looked down on anyone. I’m not saying you did. I think most of the people in the Philippines are amazing but just like anywhere there are those who want to take advantage of you because they think you are rich. I find a simple conversation usually straightens things out. I have not been to all the places you mentioned yet but plan on hitting a couple more this April. Do yourself a favor and get to know a family and stay with them in a province in the mountains sometime for a few days. The simple life is amazing and better to experience 1st hand instead of in a group. Thank you taking the time to write such an extensive reply, however, I do have to say I find your comment a bit condescending and presumptuous. You don’t know me at all, because if you did you would know that I NEVER look down on anyone. Nor do I act like an entitled uppity tourist. I travel with local transport whenever I can and often stayed at accommodation without (private) bathrooms, water and any luxuries. I ALWAYS respect people, their culture, their religion and way of life. In fact, learning about other peoples lives is one of my favorite things about travel. Furthermore, my brother in law is from the Philippines and he shares a lot with my family about his culture. Also, I think my stay in Cambulo and Banaue as well as in El Nido (with a local family) is very representative how a large percentage of the Filipinos live. I enjoyed all these stays, even if there was no shower or running water. Or when the power was cut every hour. I would love to return to the Philippines one day, it’s a beautiful country with wonderful people. This is awesome, thanks for the post. We are going in October! The air conditioning (aircon as they call it) is too cold everywhere they installed it. And even more so in the public busses. I even used the super cheap and less comfortable busses without aircon because I don’t like the cold. And always brought a coat or a sweater with me. Also don’t consider going to the movie theaters without warm clothes. The Filipinos love the cold. Really recognized the remark about the tricycle drivers pretending they were to only transport to panglau. And the fact that you always need to bring cash. Money in the Philippines is very important. Maybe it comes from the Americans that were stationed there for many years. The American culture is embedded deeply in the Philippines. Materialism is very important. Asking for Christmas presents (pasko) or asking for a travel souvenir (pasalubong) is very common. As for your story about going from one terminal to another. Too bad you didn’t know about Uber. This service you can link to your credit card and you wouldn’t have needed cash. Just download the app, set it up and the driver will pick you up. The taxi service is suffering in the Philippines because the cars are better, the drivers of Uber more polite and there is no discussion about the change/tip. Too bad you didn’t have a chance to go to Siargao island. It’s still undiscovered and pure. It’s part of Mindanao which is considered dangerous but that is not the case for the North Eastern part of it. It’s really very safe. Thank you for your extensive comment and for explaining a bit about the culture, since you have lived there I’m sure you know a lot more about it! Uber would have been a great solution for my airport situation, too bad I didn’t have the app yet (technology laggard;-).